Each year, we assign Morningstar Analyst Ratings to college savings plans based on five key pillars--Process, People, Parent, Price, and Performance. When evaluating 529 plans, we may also take into consideration the unique benefits that plans offer to college savers, including local tax breaks, grants, and scholarships, which can influence a plan's Analyst Rating but usually do not drive the overall outcome. In 2017, Morningstar identified 34 plans that it believes to be best-in-class options, assigning these programs Analyst Ratings of Gold, Silver, and Bronze. These plans for the most part follow industry best practices, offering some combination of the following attractive features: a strong set of underlying investments, a solid manager selection process, a well-researched asset-allocation approach, an appropriate set of investment options to meet investor needs, low fees, and strong oversight from the state and program manager. These features improve the odds that the plan will continue to represent a strong option for investors. Gold-rated plans have all or a vast majority of these attributes. Silver- and Bronze-rated plans embody most of these qualities but often have some room for improvement. Meanwhile, 26 plans earned Neutral ratings. These plans remain unexceptional, because either weaker aspects offset stronger ones or an element of uncertainty, such as an investment team change, clouds their prospects. Some Neutral-rated programs may hold appeal for in-state residents because of meaningful added benefits, such as local tax breaks, so investors should research their state's particular benefits. Just two plans received Negative ratings in 2017. These plans generally lack compelling traits and have at least one major flaw that makes them worth avoiding. 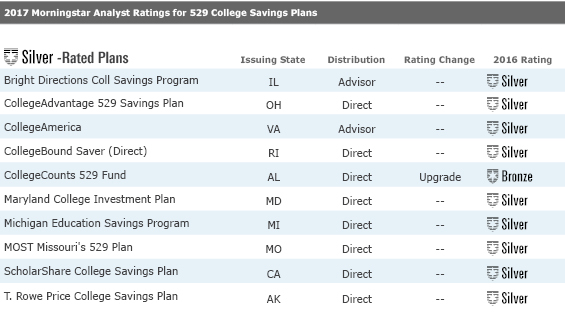 Nationwide, there are 84 529 college savings plans, and these 62 ratings represent more than 95% of assets invested in 529 plans. This year, Morningstar upgraded six plans and downgraded three, compared with six upgrades and six downgrades in 2016. We also dropped coverage of Illinois’ advisor-sold Bright Start College Saving plan, which will merge into Illinois’ other advisor-sold plan, Bright Directions College Savings Program, in November 2017. The 529 industry made meaningful improvements over the last year, with many plans reducing expenses and improving the asset-allocation approach used within the age-based portfolios by smoothing out the transition from stocks to bonds as the beneficiary ages. This article focuses on this year's upgrades. Part two of this series publishes on Thursday and will detail the downgrades along with industry trends that these plans have not kept pace with. 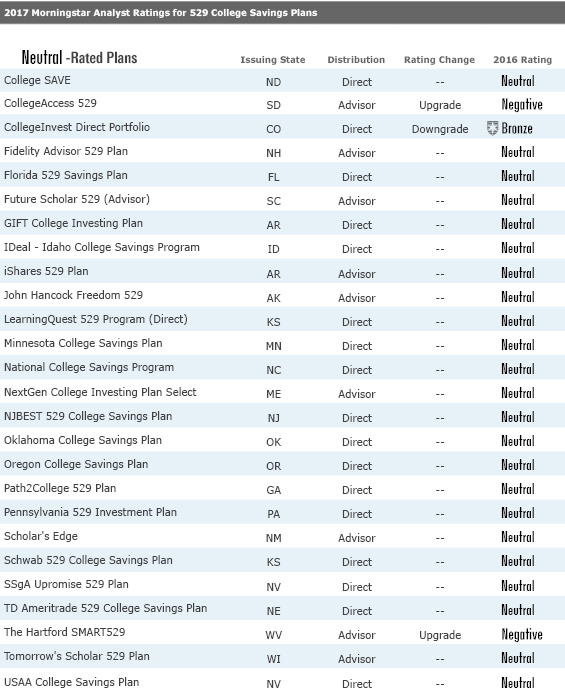 In-depth analyses of all 62 plans under coverage are located in the 529 Plan Center on Morningstar.com. We upgraded two direct-sold plans run by program manager Union Bank & Trust. Illinois overhauled the direct-sold Bright Start College Savings Program in July 2017 when it replaced program manager Oppenheimer Funds with Union Bank & Trust. With the revamped plan, investors can choose passively managed age-based tracks or tracks that blend active and passive underlying managers. The tracks have strong underlying funds, with passive strategies from Vanguard and a number of well-regarded active funds from firms including Dodge & Cox, T. Rowe Price, and BlackRock. Fees also declined; in fact, the index age-based tracks rank among the cheapest in the industry, with fees ranging from 0.12% to 0.15%, and the state also eliminated a $10 account maintenance fee that previously weighed down the index-based portfolios. The total package makes for one of the best plans in the industry, leading to its upgrade to Gold from Bronze. In addition, we upgraded Alabama’s CollegeCounts 529 Fund to Silver from Bronze. Alabama takes an active role in overseeing the plan, and Union Bank and Trust’s involvement increases our confidence that the plan will remain an exceptional choice for the long haul. Investors can choose from three age-based tracks that invest in passive underlying strategies, or they can build customized portfolios from an impressive lineup of 26 active and passive strategies. The plan is not as attractive as Illinois' direct-sold plan, however, as the age-based tracks charge higher fees than Illinois' tracks that invest in passive underlying funds. We also upgraded four advisor-sold plans. Ohio’s BlackRock CollegeAdvantage 529 plan made a number of improvements during the last year. It cut fees meaningfully, with expenses for the age-based portfolios falling by 17 basis points on average. Moreover, in November 2017, the plan will restructure the age-based portfolios by moving from a stepped approach, which courts market-timing risk by making a number of large single-day asset-allocation shifts, to a progressive process that allows for a smoother transition to bonds from stocks. The plan’s rating increased to Bronze from Neutral in light of these changes. 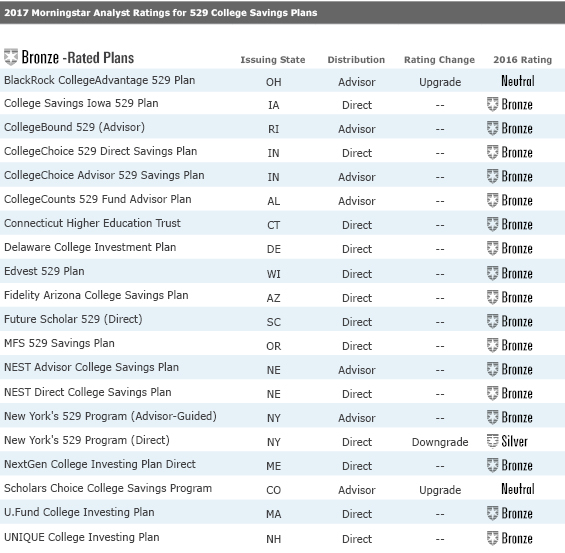 Meanwhile, we raised Colorado’s Scholars Choice College Savings Plan’s rating to Bronze from Neutral thanks to another year of stability following a program-manager shakeup in 2014. QS Investors became the program manager here after Legg Mason acquired the firm in 2014. Many of Legg Mason’s asset-allocation team transitioned to QS, though a couple of departures raised concerns. Nonetheless, the regime change has ultimately not had a meaningful impact on the plan. The underlying fund lineup remains solid, and the plan’s age-based options carry very low fees versus advisor-sold peers that invest primarily in active underlying funds. Lastly, two advisor-sold plans that we previously rated Negative were upgraded to Neutral. South Dakota’s CollegeAccess 529 plan and West Virginia’s The Hartford Smart529 College Savings Plan each smoothed the transition to bonds from stocks within the age-based portfolios, and they also lowered fees. Both plans previously had equity step-downs as large as 25 percentage points in the age-based portfolios, but now both tracks have average step sizes of about 10 percentage points. Meanwhile, both plans also cut fees by about 10 to 15 basis points. Process: Did the plan hire an experienced asset allocator to design a thoughtful, well-diversified glide path for the age-based portfolios? What suite of investment options is offered? People: What is Morningstar's assessment of the underlying money managers' talent, tenure, and resources? Parent: Is the program manager a good caretaker of college savers' capital? Is the state managing the plan professionally? Performance: Have the plan's options earned their keep with solid risk-adjusted returns over relevant time periods? How is the plan expected to perform going forward? Price: Are the investment options a good value? Want to learn more about your plan's strengths and weaknesses? Go beyond the Morningstar Analyst Rating and read detailed analyses of 62 of the largest 529 plans. Click here to try a Premium Membership, free for 14 days.